The starting point of any economic system gets back to one basic mechanism: demand and supply. Demand takes place because of two main reasons 1) There are different needs of different individual and 2) The individual actually wishes to have something. Because of this second reason the large markets of any economy faces serious shortage problems. In all the cases of demand exceeding supply there will be a clear problem of shortage in the economy. This is what exactly is happening in the market of United States. There can be cases of disequilibrium where demand does not match the supply. What should happen to demand if supply is quite less in the market. In that scenario demand can never be equal to supply and there will surely be an increase in price rise all over the market of particular good. Demand and supply are governed by two laws of the market, called Law of Demand and Law of Supply. Law of Demand: If the price of a Commodity will increase in the market, the quantity demanded for that tomato will fall, given everything else is constant (ceteris paribus). For example, if Sam’income is $50 per month and he buys 10 Commodity at a price of $5 each; and if the price increases to $6 and his income remains same at $50, he cannot buy 10 Commodity. Law of Supply: If the price of Commodity increase, the quantity supplied of Commodity will increase, given everything else is constant (ceteris paribus). So, if a farmer is selling the Commodity at $1 per kg and suddenly the price of Commodity increases to $2; he will sell all his stock of Commodity before the price comes down. ( Harsanyi, John C. 1973). 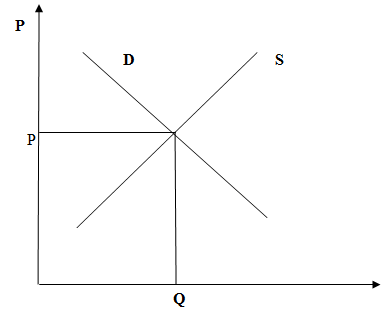 1) Demand and price have a negative relation. As price goes up demand goes down. 2) Supply and price have a positive relation. As price goes up the supply goes up. 4) Equilibrium will take place at E0. 5) Whenever there is any type of shock to supply shock the supply will respond to it. 6) Supply will go to the leftward direction in any case of negative supply shock. 7) Any reduction in supply levels will cause immediate changes in prices. 8) Prices will increase in any case where supply levels are falling. 9) Demand will be matched by supply due to change in prices. 10) Demand will equal supply once again in equilibrium. Walmart is a discount store. It has very large operations in US. It mainly provides all items on a regular discount basis. It is a very big employment generation company as well. Walmart has an oligopolistic structure and face a lot of competition from other stores. The biggest competitors of Walmart are Kmart, Target and Shoppko etc. These are also discount stores .In order to sustain its market position Walmart has to take decisions keeping in mind the strategies of other competitors. In case of oligopolistic structure the firms cannot take independent decisions. “Mass society as its critic asserts has its own style of culture”( Paul Di Maggio , 2004). There is a very strong culture of discounts in United States these days and Walmart can set its position strong only by giving high discounts on the products it offers. Numbers of firms are limited. The size of each firm does not determine whether the market is oligopoly or not it’s the number of firms that determine it. Products that they sell can be differentiated or undifferentiated. Firms in the market are interdependent. Each firm has an ability to affect other firms through their actions. Each producer enjoys some market power. Oligopolists enjoy the power of economies of scale. Market power come from the : Patents, Investment, High Quality raw materials. Does Walmart Company really fit the oligopoly market structure? Each firm has a good and large part of the market on their sides even the slightest Change in behaviour of one firm will cast a large impact on the demand curve of the others firms. This is the reason that the firms do not have very static demand curves. 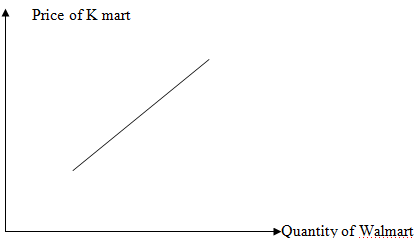 For instance if Walmart changes its price, Then K mart’s demand curve will surely be affected. 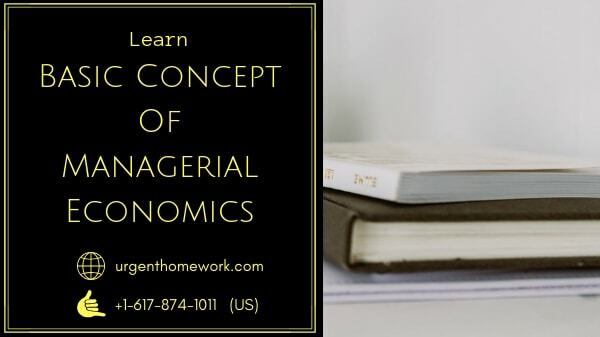 Due to the dependence of behaviour of one firm on the behaviour of other the output determination by analysing the firm’s costs and the firm’s demand curve is difficult. Suppose K mart can work out its own best price and output, but then Walmart can also make some reaction and change its own best price or output. This change will have an impact on K mart’s demand curve and thus K mart’s calculated best price and output are no longer valid. The behaviour of Walmart is very much dependent on K mart and K mart will have to adjust its price and output accordingly. If Walmart introduces a price cut then it will influence the demand and sale of K mart. K mart being a very close competitor will face shifts in its demand. Similarly, the behaviour of K mart is very much dependent on Walmart and Walmart will have to adjust its price and output accordingly. If K mart introduces a price cut then it will influence the demand and sale of Walmart. Walmart being almost a Competitor will face shifts in its demand. 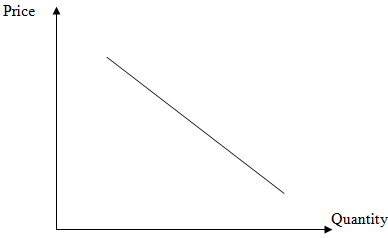 The demand curve for Walmart can be drawn as following. Here on the vertical axis we have Walmart own price and on the vertical axis we have Walmart’s quantity. NOTE: Higher the price of Walmart lower the quantity demanded. 2. Kinked Demand Curve Analysis. Competitors like K mart and Walmart will never let each other cut their prices. If K mart tries to reduce the price then Walmart will try to match its price cut. Walmart will also have to reduce its price as well. If Walmart will reduce its price to match the price cut planned by K mart then K mart will not get an increased demand of its customer. “It is very well agreed among economists that ordinary concept of demand cannot be applied in oligopoly”. (Paul . M . Sweezy ( 1939). "The imagined demand curve will be different from the reality"( Harsanyi, 1973). Initially the price of K mart is P. Now when K mart increases its price then customers will switch to Walmart. And Walmart can increase its quantity demanded. But when K mart will reduce its price then Walmart will match its price cut. We get a kinked demand curve in this case as described above. Demand change will be low as prices will be matched. In this price war both K mart and Walmart will suffer losses. And Both the companies will avoid price wars with each other and try to make demand curves stable. If producer A raises his price then the rival producer B will acquire customers. ( Erickson, G.M. ,1992). 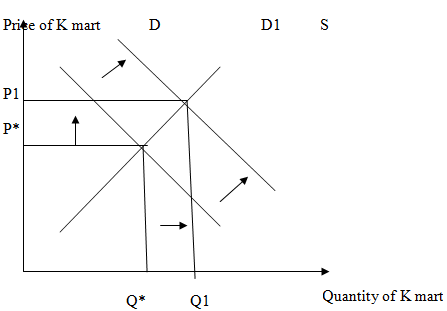 Demand and Supply Analysis : We analyse the economic theories related to Walmart in the framework of demand and supply. We see how change in the expectations of future prices of Walmart and its related markets. We analyse how the change in price of Walmart affect its markets of substitutes, complementary goods and inputs. Economic Analysis: Suppose a belief has developed in the market that prices of Walmart are expected to rise in the near future ie. it now lowers its discount rates. 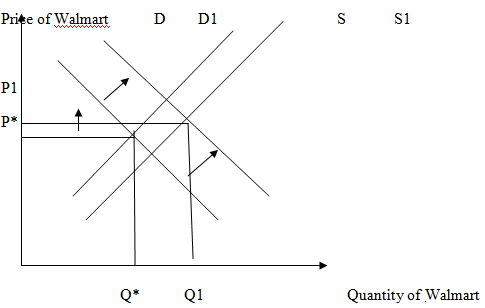 And we know that one of the determinant of aggregate demand is expected inflation which was assumed to be fixed when the aggregate demand curve is derived, but shifts the aggregate demand curve when there is any change in it.An increase in the expectations about future prices causes an increase and make the demand curve go rightward. "A decrease in the expectations about future prices causes a decrease or leftward shift of the aggregate curve" (Erickson, G.M. (1992). Inflationary expectations affect the consumer’s expectations about future prices. “In non-competitive environments, changes in incumbent output and industry profitability are inversely-related to changes in the equilibrium price following a demand shift. In response to rotations of demand through the equilibrium point, changes in profitability are positively-related to changes in industry concentration and, when marginal costs are non-decreasing, inversely-related to changes in market power” (Stephen F. Hamilton, 2005). Expectations about future prices work in the following manner for buyers like buyer’s want to purchase a good at the lowest possible price. So there can be two possible cases :If buyers expect higher prices in the future, then they increase their demand in the present. If buyers expect lower prices in the future, then they decrease their demand in the present .Also change in expected prices will affect the supply side of Walmart market. It will shift to right and we have following scenario. Conclusion: The increased expectations about prices will shift the demand curve to the right and we have new demand curve D1.Also the supply curve will shift to right. This will put the upward pressure on prices and price will increase to keep the market in equilibrium. The result is the increased price and increased quantity. Relation : K mart Company and Walmart are competitors. Economic Analysis : Now we know that K mart is considered to be Competitor for Walmart. When increased price expectations about prices increased the price for Walmart then market for K mart will also be affected. K mart is a Competitor so when price for Walmart rises people will want to have more K mart. So demand for K mart will rise due to higher prices of Walmart and demand curve will shift to right. “These results do not depend upon the fact that each private firm maximizes its own profits.”( Yoshihiro Tomaru, 2007). Conclusion: The changed situation will shift demand curve to the right and we have new demand curve D1.This will put the upward pressure on prices and price will increase to keep the market in equilibrium. The result is the increased price and increased quantity. Prisoner’s Dilemma is one of the very famous strategy of game theory. It makes us understand how policies and strategies govern the balance between cooperation and competition in businesses. “The stability of the Cournot equilibrium for a linear oligopoly with multi product firms is analyzed”( Koji Okuguchi , 2003). We apply the same concept of Prisoner’s Dilemma to Walmart analysis. Suppose there are two players in the market Walmart and K mart and they both have to devise their optimal pricing strategy. They both are doing the best when they both charge a high price. In this case they are fully using their market power and making huge profits. Suppose when they both charge a higher price they both make a profit of $30 million annually. Now suppose one Company smartly lowers the price and extracts all demand away from the rival firm. Then one will earn a higher profit and other will earn a lower profit annually. Suppose both set a lower price and earn lower profits annually. "Setting high prices is a strategy of cooperation where both firms are cooperating with each other and making huge profits"( Harsanyi, John C,1973). Setting lower prices is a strategy of cheating which is a dominant strategy for each company but they end up losing profits. Dominant strategy make them worse than cooperating with each other. The two players in this case are Walmart and K mart and there are two choices are "cooperate" and "cheats". Players Walmart and K mart can play either cooperate or cheat. Once each player makes a choice, he will announce it to the other player; and then both Walmart and K mart will calculate their payoffs corresponding to the strategies chosen. Thus, in the case above, if Player Walmart chooses to cooperate while Player K mart cheats, then Walmart gets 3 points and K mart gets 4 points. If both players cheat, they each get 1/2 point. This example tells how K mart and Walmart will decide on their pricing strategies. “They can choose to either cooperate or cheat”( Kaplow, Louis. (2009)). They need to manage their payoffs also and maximize them. If they both cheat on each other then they get the lowest payoffs. So its better for both Walmart and K mart to cooperate and earn maximum profits. 1) The company faces the major problem import duties.” Equilibrium market structure is a function of the underlying technology. Familiar configurations such as a duopoly competing in exports or a single multinational producing in both markets arise as special cases. Small tax-policy changes can produce large welfare effects as the equilibrium market structure shifts, implying discontinuous jumps in prices, quantities and profits.” (Ignatius J. Horstmann, 1996). So, any country importing Walmart products would be paying the major chunk of import duties. This affects the market of Walmart badly. 2) Being a discount store Walmart faces a lot of taxes problems from countries worldwide which again affect its profitability. 3) Walmart also loses a lot of revenues in the form of different currencies and exchange rate conversions. Walmart company need to make its staffing process more dynamic. Its very important to staff creative managers who can take fresh and efficient decisions suiting to the changing needs of organic structure of the company. Company needs to have very open policies regarding the employee and employer interaction. It needs to build smooth communication between people at higher levels of hierarchy and people at lower end of spectrum .This can help the company improve and progress more efficiently in the right direction. It can charge higher prices if there is an expansion in demand. “ An expansion in demand can lead to higher price charging by producers”( Kaplow, Louis. 2009). Employees should be given a chance to give new and creative ideas for improving the productive, allocative and distributive efficiencies. Ideas should flow from each level of hierarchy. Company should also make sure that it does not get into any price wars so that they can make maximum profits rather than losing money in price wars and rigidities. Walmart needs excellent form of human capital. It’s a dynamic firm and human capital is the major component of its capital structure. So company should be very cautious while deciding about its employment structures. ( Kaplow, Louis. (2009).